Editor’s note: Each year Dance/USA matches experienced leaders in the dance field with rising professionals for the Dance/USA Institute for Leadership Training (DILT), a one-on-one mentorship experience. During this season of gratitude, one of our 2017 mentor-mentee pairs have written thank-you letters that illuminate the value of the relationship and of mentoring. This story was originally published in 2017. Learn more about DILT here. What a joy it has been to connect and experience support, build camaraderie, and exchange nuggets of wisdom with you over the past few months. I’ve so appreciated our time together investing in each other’s visions and laying the groundwork for an ongoing partnership of positive, forward movement! 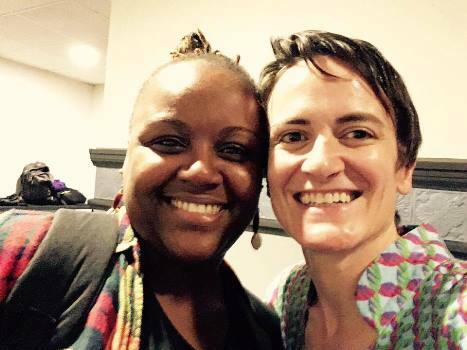 Meeting one another and getting to laugh together right away in that DILT workshop at the Dance/USA Conference in Kansas City was a delightful beginning. It was so refreshing to get a chance to learn about each other through movement and by sharing some big perspectives on life before we began this journey together. As we shared lunch outside under the tent later that day, I found it invigorating to hear about the breadth of your vision for Red Clay Dance Company and your desire to offer so many opportunities for both artists and community members alike to thrive in your beloved Chicago. I remember sharing about Gina Gibney’s own work with using dance as a mechanism for discussing healthy relationships with young people and seeing the overlaps with the great work being facilitated by Red Clay Dance. Our week together in New York this September was so inspiring! It was fabulous to welcome you into both our 280 and 890 Broadway locations for rehearsals with guest choreographer Shannon Gillen and several of her collaborators at VIM VIGOR DANCE COMPANY. I was so buoyed to sense your supportive energy as we began to navigate the Astroturf-covered floor and extreme psychological states of mind that would both become foundational to Shannon’s new work. I was also honored to welcome you to the first rehearsals of the re-staging Gina Gibney’s “Drafting Foresight,” a piece she recently choreographed on Cleveland-based GroundWorks DanceTheater, and then exchange ideas over dinner later that night about best practices for video archiving, choreography retrieval, and re-imagining repertory works. Our conversation about holding true to the original intention of the work and allowing for the expertise and personalities of the artists now animating the piece reinforced for me the beautiful alchemy and fertile tension involved in sustaining all types of institutional knowledge within an evolving organization over time. It was fantastic to have you join our Board of Directors season kick-off meeting and meet so many of our key Gibney supporters and champions. I hope experiencing a presentation about the programming happening at our two centers, within our full-time resident company and through our varied Community Action programs, offering resources for violence survivors and prevention initiatives for young people, gave you a better sense of the many ways that Gibney is “making space for dance.” It was satisfying to know that so many staff members on the Gibney team got a chance to connect with you and feel your proactive spirit. I reveled in the opportunity for a retreat-style time for “making space for everything” from staff morale, season curation, international touring, building relationships with funders and foundations, lesson planning for participatory workshops, operations logistics — all discussed with thoughtful care in equal measure. I was overjoyed that your timing in New York City also allowed for you to reconnect with your colleague and our current Community Action Artist in Residence Maria Bauman to experience her stunning performance series at 280 Broadway. Our meetings have had me reeling from the quality and quantity of partnerships that you’ve cultivated in Chicago and beyond — all aimed at building bridges, unlocking knowledge, and sharing wisdom across populations. My chance to follow your recent residency in Uganda on social media and then connect to learn of the energy and momentum created and amplified between Red Clay Dance Company and Keiga Dance Company reminded me once again that we are indeed all in this together and that positive change is possible! I’ve seen our mentorship opportunity as a loop of energy and information — each of us coming with open hearts and hands bringing expertise and encouragement to offer and share. Early in my career I had this ridiculous notion that artists were a combination of lone wolves and Zeus — that fully fledged ideas popped from a single person’s vision, created alone, implemented without assistance and aimed at creating a legacy of “I did it my way!! !” With the incredible mentorship of visionaries like Gina Gibney and others who I’ve had the great fortune of engaging with, I’ve of course realized that the exact opposite is true. Sustainable innovation happens in relation to the actual needs of a collaborative environment that values individual agency supported by iterative thinking, perseverance and compassion. As we make space for ourselves and our artistic visions, it is vital that we simultaneously and joyously make space for others. I cannot express enough my gratitude for the opportunity to connect with you and everyone at Gibney Dance over the past six months. When starting the DILT program I really wasn’t sure what to expect, but as I reflect to our first session at the Dance/USA Conference, I remember thinking as we began introductions, “I wonder what her story is going to be and will she genuinely connect with my story?” Well, I was excited to hear you are a Midwest girl like me and so it eased my mind a little to know that we had something in common beyond dance. I was interested in making a genuine connection, and I am so grateful that your heart and spirit were in the same place. Our initial conversation during lunch at the Conference was eye opening and exhilarating. I was excited to listen as you shared just a bit about all the amazing work that Gibney Dance does, but was elated to know that I would get a sneak peek inside of such a vital organization to the dance field during my visit in September. So, my visit to Gibney Dance Center was nothing short of amazing. I had the opportunity to speak, very candidly and at length to several key staff of the organization, from marketing/development, education, and community action. I felt very welcomed and a part of the Gibney family. Honestly, from the door man to the custodial staff to the front desk … everyone was very warm and helpful, and that is a culture I want to ensure lives inside of Red Clay Dance Company. I loved the fact that the first part of the visit was to sit in on your rehearsal process with Shannon Gilliam. As a dancemaker it is always an honor to be invited into another choreographer’s process. The fact that she didn’t know me, but welcomed me in anyway speaks again to the amazing culture that Gina has created at Gibney Dance. I listened very intently to the words and prompts Shannon and her dancers gave the artists from Gibney Dance and I was inspired by what I heard. Phrases like “Wow! Look at you!” “Way to go!” “Wait…what was that…that was fantastic,” and “What if we…yeah, yeah … great idea,” rang in my ear all throughout the entire rehearsal. The use of this type of language reminded me of how important it is to create a brave but encouraging space for my dancers, even when we are tackling movement or content that is challenging or uncomfortable. The conversations with the marketing/development, education and community action teams was very informative and sparked some new ideas for how Red Clay Dance Company can not only strengthen our marketing and development efforts but also some tools to further solidify the curriculum we use in our education and community programs. Our final dinner was a great way to end the visit. The food was amazing and the conversation was inspiring as always. I am still amazed at all that you juggle, daily, at Gibney Dance, and I will carry your hat analogy that you shared at our first meeting as I continue to grow as a leader. “It’s not about putting on and taking off the many hats we wear as artists/administrators/educators/activist, but just shifting a little to the left or right as we move throughout our life, knowing that all of those roles make us who we are and they really just create one big, beautiful hat of ARTISTIC LEADERSHIP! Amy Miller is a New York City-based dancer, choreographer, educator and advocate. A former principal dancer with the Ohio Ballet, she was also a founding member and artistic associate of Cleveland-based GroundWorks DanceTheater. Now the senior director and a performing member of Gibney Dance Company, Miller also focuses on Gibney’s Community Action initiatives through facilitating movement workshops with survivors of trauma, conducting both local and international trainings for artists interested in engaging in social action, developing healthy relationship workshops for young people and raising awareness about the role of the arts in violence prevention. Miller has conducted Gibney Dance Global Community Action Residencies at Mimar Sinan University and Koc University (Istanbul), University of Cape Town (South Africa), DOCH: School of Dance and Circus (Stockholm), MUDA Africa (Tanzania) and most recently in Gisenyi, Rwanda. In the spring of 2015, Miller was honored to receive an Arts & Artists in Progress “Pay it Forward” Award from Brooklyn Arts Exchange. Miller holds a BFA in dance and is a recipient of an Ohio Arts Council Individual Excellence Award for her choreography. Vershawn Sanders-Ward is a movement artivist, founder and executive artistic director of Red Clay Dance Company based in Chicago, IL. A native of Chicago, Sanders-Ward holds a MFA in Dance from New York University and a BFA in dance from Columbia College Chicago. Her work has been presented at festivals in New York, San Francisco, Chicago, Kalamazoo, Toronto, Toubab Dialaw, Senegal, Kampala, Uganda and The Yard at Martha’s Vineyard. She is a 2017 Dance/USA Institute for Leadership Training Mentee, a 2013 3Arts awardee, and the recipient of a 2009 Choreography Award from Harlem Stage NYC for the creation of her solo work, “New World Afrikan,” which premiered at the Dance Transmissions Festival in Kampala, Uganda. Vershawn has served as an adjunct faculty member, facilitated residencies, and received choreographic commissions from Columbia College Chicago, Knox College, Northwestern University, City Colleges of Chicago, AS220, and the National Theatre in Kampala, Uganda. In 2015, NewCity Magazine selected Ward as one of the “Fifty People Who Really Perform for Chicago.” Vershawn proudly serves on the steering committee for Enrich Chicago, a group of arts organizations and foundations that have made racial equity in the arts their primary focus.